Behringer's four-input/four-output U-Phoria UMC404HD interface gives you the connections and flexibility you need to outfit a modest computer-based project studio. 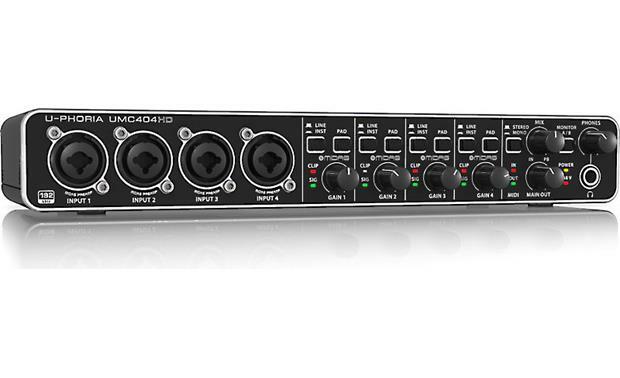 Its four built-in mic preamps let you capture live takes with multiple musicians. All in all, you get a ton of features for the money, which is exactly what we've come to expect from Behringer. Each of the four front-panel inputs is a combination jack that handles dynamic or condenser microphones, line-level instruments like keyboards, and even electric guitars and basses. Around the back, you'll find 5-pin MIDI input/output jacks for plugging in a compatible controller. This interface can return four independent channels from your DAW software, which you can assign to the four 1/4" TRS or RCA playback line outputs on the back. Hook up a pair of powered studio monitors to the main left and right 1/4" outputs, or plug in your favorite pair of headphones to the front-panel jack. The UMC404HD works with all major DAW (digital audio workstation) software for the Mac® and Windows® platforms. To get you started, it comes bundled with a powerful DAW called Tracktion, along with a range of audio effect plugins. 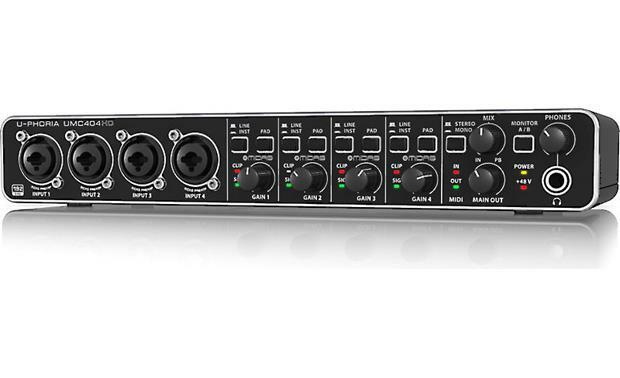 Overview: The Behringer UMC404HD is a compact and versatile USB recording interface featuring 4 input channels, each with MIDAS designed pre-amps, studio-grade 24-Bit/192 kHz converters, zero-latency direct monitoring while recording, analog inserts for using outboard effects processors, MIDI input/outputs, and more, all housed in Behringer's "built-like-a-tank" impact-resistant metal chassis. MIDAS Pre-amps: MIDAS is a company that's earned its reputation due to their no-compromise approach to audio and build quality, particularly their award-winning mic preamps which are considered to be one of the industry's best sounding designs. 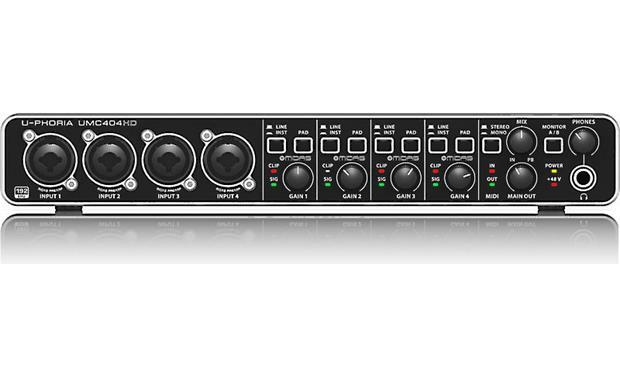 Each of the UMC404HD's four Inputs include MIDAS pre-amps and can accept mic, line, and instrument level signals. Zero-Latency Monitoring: The UMC404HD mix control allows zero-latency direct monitoring, which allows you to hear the performance clearly with no delay or lag in the returning signal. Tracktion: Included as a free download after registering the interface, Tracktion is a full-blown Digital Audio Workstation (DAW) for composing, recording, editing, and mixing your music. Tracktion gives you features such as dynamic automation, unlimited track count, MIDI recording, and support for VST and AU plug-ins. Power: LED indicates unit is on or off. +48V: Lights if the rear panel Phantom Power switch is engaged. MIDI IN and OUT: These will light indicating MIDI data flow in or out of the interface. USB: A USB type-B, 2.0, output provides connection to your computer for audio transfer to and from your DAW and is compatible with most popular recording software including Avid ProTools, Ableton Live, Steinberg Cubase, and many others. MIDI IN and OUT: These standard 5-pin DIN MIDI connections allow MIDI note and control data to move between the interface and your DAW. This lets you integrate keyboard controllers, drum pads, and other MIDI devices for triggering and controlling sound sources inside your DAW and external modules, as well as outputting MIDI data during playback. +48V: This On/Off switch puts +48V of phantom power to each of the 4 input jacks when engaged. Playback Outputs: Four Playback Output channels are provided for additional monitoring or recording, A and B, each with a pair of RCA and 1/4" jacks, 1/2 for A and 3/4 for B. Main Out: The Main Output of the audio interface consists of Left and Right balanced XLR and corresponding 1/4" TRS jacks. Inserts: Four Insert jacks are provided to route signals to additional devices such as effects processors. If a balanced cable (TRS) is inserted, signals can be routed to and from the processor, and if a unbalanced cable (TS) is inserted, signals can be routed out from the interface. 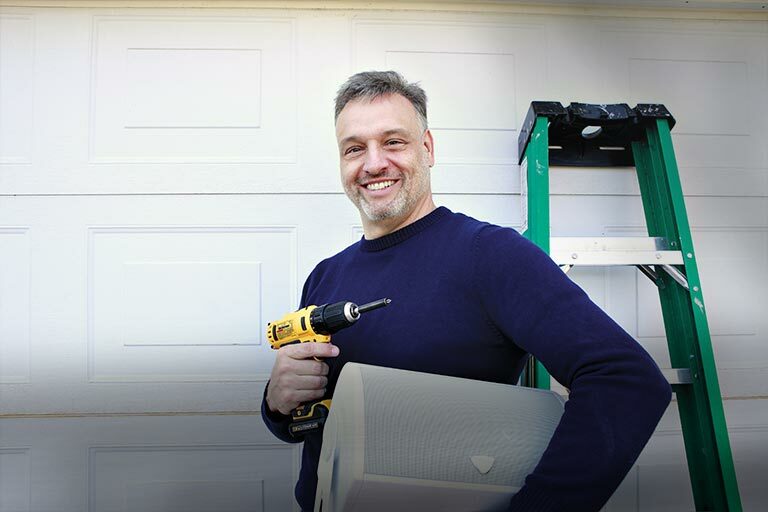 Kensington Security: Unit includes a Kensington Security lock point. 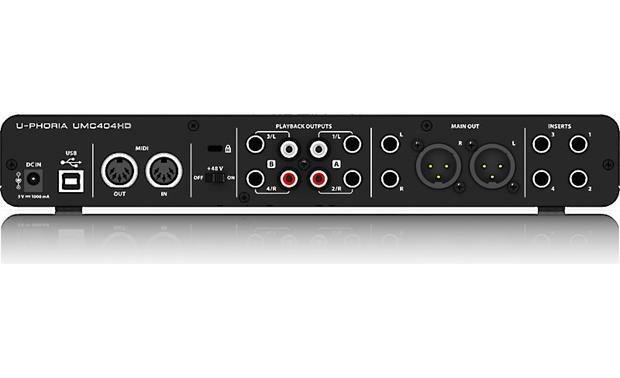 Searches related to the Behringer U-Phoria UMC404HD USB 2.0 audio interface for Mac® and PC.